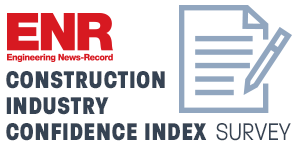 The Construction Industry Confidence Index (CICI) Survey results provide an important insight into the current and future health of the construction industry. Your response to this CICI Survey will help ENR provide your firm and others with valuable insights regarding the outlook for the construction industry. This is ENR Magazine’s Top Green Construction & Design survey. 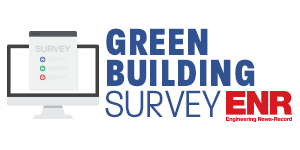 This survey will be used to generate the Top Green Design Firms list and the Top Green Contractors list, both to appear in the ENR Top Environmental Sourcebook to be published in August. 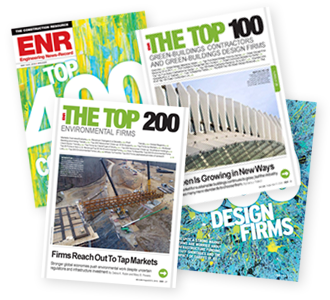 ENR will publish The Top 500 Design Firms Sourcebook and the Top 400 Contractors Sourcebook, ranking U.S.-based firms in almost 60 separate market and submarket sectors. With these lists, contractors and design firms will be able to demonstrate activity in particular areas of expertise. 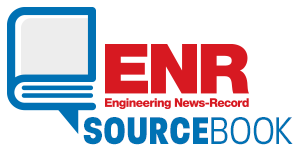 Top 100/400/500 is Engineering News-Record’s annual survey of the industry’s leading contractors and design firms. 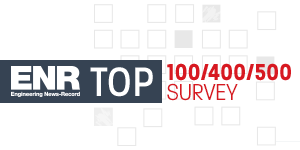 Results of this survey will appear in our rankings of The Top 400 Contractors, The Top 500 Design Firms, our Top 100 lists of the largest construction managers and design-build firms, and in ENR’s Sourcebooks. 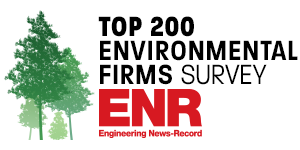 The ENR Top 200 Environmental Firms survey ranks the top firms in the dynamic environmental services sector based on participants’ global revenue from noted categories of environmental services from the previous year. Survey data will generate the Top 200 listing and related global market analysis.